This year, Storytime Underground is issuing a new blog challenge: Storytime for Social Justice. We are asking youth services librarians to use their storytime power for social justice, to take a long hard look at their programs, displays, and services, to make sure we are fighting every day for empathy, inclusiveness, and social justice, and be a #StorytimeJusticeWarrior. Use at least one book featuring and/or written by people of color (or other marginalized, underrepresented characters) in every single program. I’ve actually been trying to do this for a few months, and it isn’t always easy. Sometimes I don’t make it, but then I push even harder to make sure my next program uses only books with/by POC. Also, representation is way more important than some cutesy theme, so get over that excuse. But also, check out Everyday Diversity which includes themes with book suggestions. Book talk and recommend more diverse books with POC and #ownvoices books. This means reading more diverse books too. If you aren’t reading diversely, then go read this post. Make my storytimes and other programs more inclusive by using language to offer alternate activities (“If you are able, lift your baby in the air. This can also be a snuggle song!” and “If you want to, let’s jump for this verse.”), asking parents to correct me if I mispronounce their child’s name, being intentional about the songs and activities I choose (we no longer clap our crazies out in my library! ), and always listening to people telling me new ways to be inclusive. Seek out new favorite standby songs and flannel boards that include diversity. Got a suggestion? Please share! Continue to feature displays highlighting diverse books. 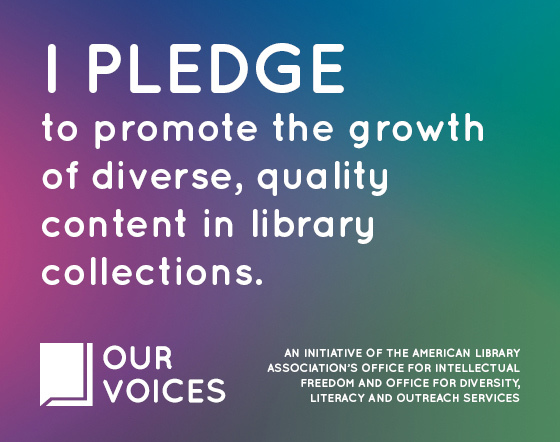 Follow more blogs about diverse books and by librarians and authors of color, and follow more librarians and authors of color on Twitter. This is just a start! As I continue to learn and challenge myself, I will continue to add to this list.